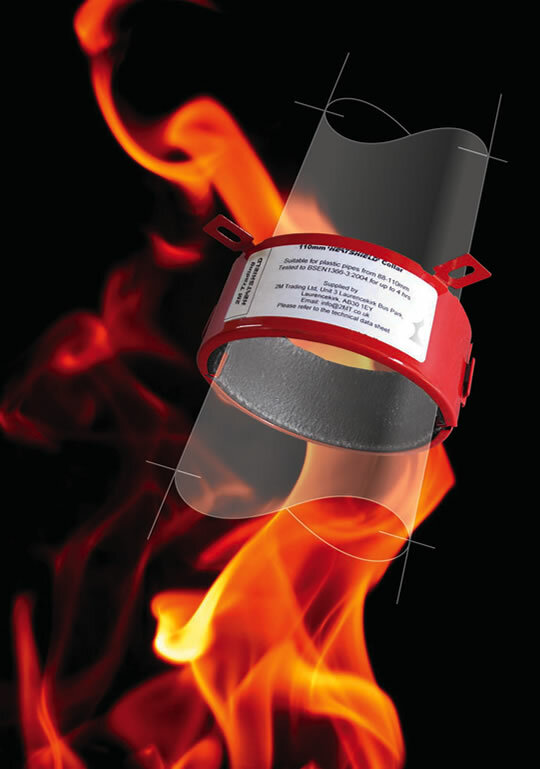 2MT HEATSHIELD Intumescent Pipe Collars and Pipe Wraps are designed to restrict the spread of fire and smoke from one compartment to another where plastic pipes penetrate separating walls and floors. 2MT HEATSHIELD Intumescent Pipe Collars consist of a steel shell, which contains the reactive intumescent material. Each Pipe Collar is supplied in two pre formed semi circular halves which simply slide together to lock them closed around the pipe during installation. 2MT HEATSHIELD Intumescent Pipe Wraps are manufactured using a factory sealed flexible plastic sleeve which contains the correct amount of heat reactive intumescent material. The Pipe Wrap is easily installed by wrapping around the pipe and is held closed by an integral adhesive tab. They are designed to be cast into the separating wall or floor, and must not be surface mounted. 2MT HEATSHIELD Pipe Wraps offer a cost effective solution where installation of Pipe Collars may be too difficult due to restricted space for surface mounting. Comprehensively tested and assessed by independent authorities in accordance with BS EN 1366-3 2004 & 2009, and BS EN 13501-2: 2007 + A1: 2009 for up to 4 Hours fire resistance. Corrosion Resistant – Collars available with Powder Coated, Zinc Plated Steel or uncoated Stainless Steel outer shells. Available in the wide range of sizes to suit standard pipe diameters. 2MT HEATSHIELD FR Pipe Collars and FR Pipe Wraps can be used in walls or floors, (for Installation details please refer to relevant technical data sheets). How do HEATSHIELD FR Pipe Collars & Wraps work? When exposed to heat, the graphite based intumescent material contained in the devices activates and expands, exerting a high pressure on the softening plastic pipe, thereby causing the opening to be sealed preventing the spread of fire and hot gases from one compartment to another.